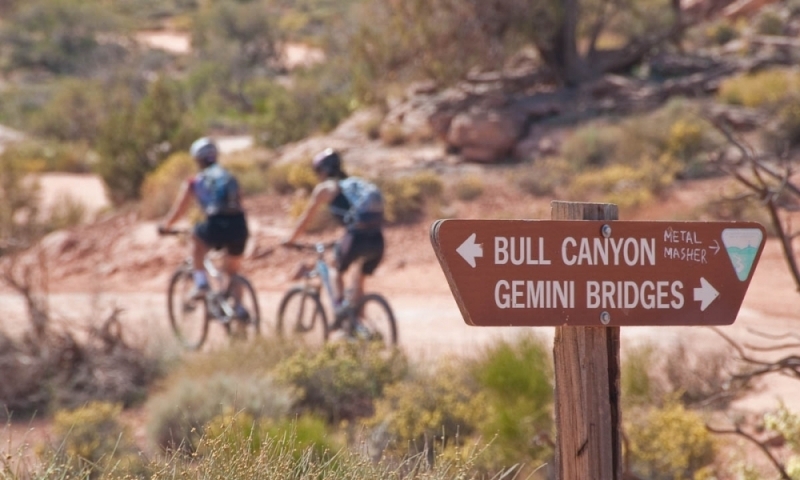 Gemini Bridges is one of Moab's most well known mountain biking trails, offering its visitors beautiful views of the Moab Valley and the La Sal Mountains, interesting rock features, and two rock bridge crossings, the exposure on which is more obvious once you've crossed them. Gemini Bridges Trail is an easy 4x4 route as well and you'll only need 4WD in one section. 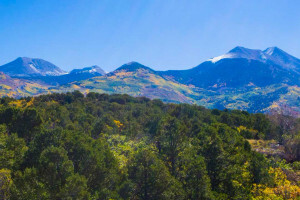 Typically ridden as a one way ride, Gemini Bridges is a relatively easy mountain biking trail because it is mostly a descent along a dirt road and some jeep trail. This road is often frequented by 4x4s and ATVs as an easy off roading option. 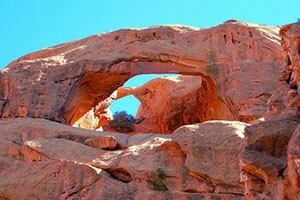 Gemini Bridges Trail is located north of Moab, Utah. Drive north out of Moab on US 191 for 11 miles to a dirt turnout on the west side of the highway and just 1.3 miles before the turnoff for Highway 313. For an out-and-back ride, park your car at this turnout and start riding your bike up the trail. For a loop ride or to shuttle a car, park your car at the turnout and continue up US 191 to Highway 313, where you will ride or drive uphill for 12.8 miles to a dirt road on your left marked Gemini Bridges.